Midsize luxury sedan packs in the amenities. 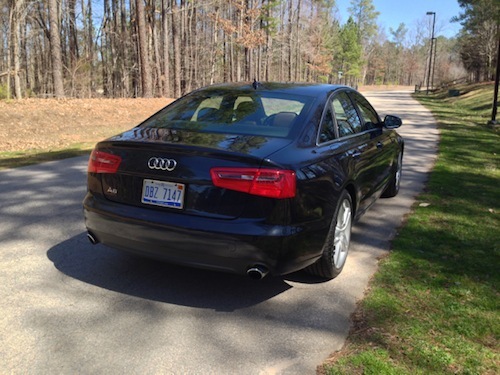 2014 Audi A6 with four cylinders. I may have to rethink my long-held position against placing four-cylinder engines in larger cars. 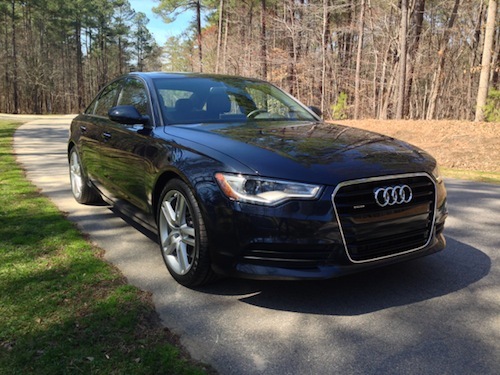 Especially after spending a week with the 2014 Audi A6 Quattro Tiptronic edition. 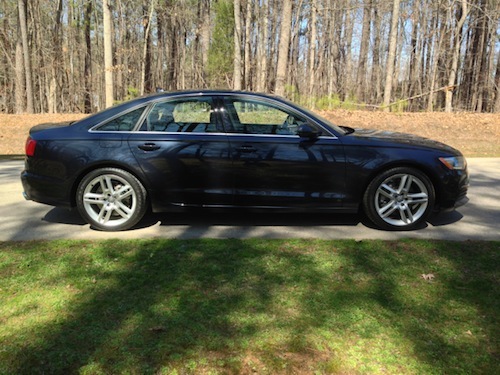 The midsize A6 is not the largest sedan in the Audi fleet that distinction belongs to the A8. But, with a 114.7-inch wheelbase and 111 cubic feet of interior space, it is longer between the wheels and has more room inside than the Cadillac XTS, itself billed by GM as a large sedan. What the XTS does not offer is a four-cylinder engine, the standard bearer for the A6. And that Audi four-banger makes good use of every cylinder with turbo fuel stratified injection (TFSI) at work. TFSI provides several advantages over naturally-aspirated engines, indeed over other turbocharged engines. In this case fuel is pressure-injected right into the combustion chamber, what provides excellent thrust while lowering emissions output. Turbo lag? None was felt. Was more power desired? At times that answer was yes, but there is a simple resolution for shoppers to consider before buying an A6: an available supercharged 310-horsepower V-6 engine. Me thinks that most buyers will be happy with the four unless your performance aspirations trump everything else. And if it is optimum fuel economy you want, then a 3.0-liter diesel engine making 24 mpg in the city and 38 mpg on the highway is another option, but available only with the Premium Plus and Prestige editions (see 2014 Audi A6 TDI Quattro: Diesel Does It!). The Audi A6 made its debut in 1995, replacing the previous 100 series. In 2012, the fourth generation model was introduced, thus the current edition is now approaching the halfway point of its product cycle. Audi makes the A6 available in Premium ($43,100), Premium Plus ($47,400) and Prestige ($57,900) editions. As tested, a Premium Plus model equipped with an eight-speed automatic transmission and quattro all-wheel drive was provided, adding $2,100 to the base price and tacking on $4,300 worth of options. Front-wheel drive is standard with the base model. It had been a long time between Audi drives for this writer, but one thing I can say is this: the quattro system is simply excellent. Audis quattro technology has been around for more than 30 years, what represents a permanent all-wheel drive system. It not only sends power to the wheels that need it the most, but it does so consistently. That consistency was revealed in several tests I undertook including those conducted on slippery roads and where slalom-like twists and turns were required. In one particularly important challenge I approached a clear, rural intersection at 30 mph and made a 90-degree turn without reducing my speed or braking. 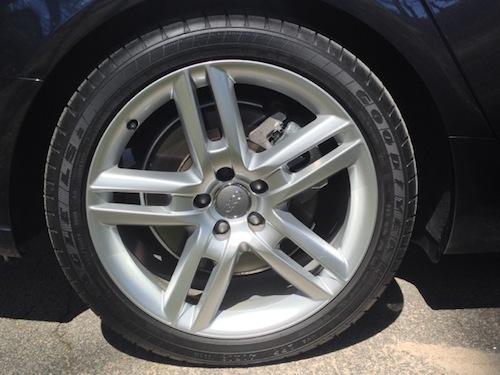 The A6s wheels remained planted and the steering stayed under my control. No white knuckle driving, but plenty of exhilaration as the big sedan cooperated better than I had expected. Ill take my Audi with the quattro, please. The 2014 A6 advances Audis design language dominated by a trapezoidal grilled flanked by halogen or xenon headlamps. Signature daytime running lights punctuate the front fascia, providing a distinctive look that is at once aggressive as it is elegant. Audis four interlocking ring design is centered at the top of the grille. The Audi A6 projects a formal, yet athletic stance, casting confidence and boldness with its sleek lines, sharp profile characteristics, and its notched rear deck. It represents a design that has evolved with time, but wont soon look outdated. Aluminum trim, dual exhaust, and LED lights within the tail lamps mark its rear fascia. Inside, the cabin is roomy, bright and impeccably designed. Leather seating is standard with wood inlays and aluminum trim complementing the high-end materials laid across the dashboard and elsewhere in the cabin. Standard equipment includes keyless start, a tilt and telescopic steering wheel column, eight-way power heated front seats with driver lumbar support, three-zone climate control, power adjusted and heated side mirrors, and a four-spoke multifunction steering wheel. The sedan also comes with a power glass sunroof with a tilt and slide feature, illuminated door sill inlays, an infotainment system, and a split-folding rear seat. The test model was also equipped with several upgrades including Moonlight Blue Metallic paint ($500), Audi side assist ($600), a Bose Sound System ($850), and a 19 sport package ($1,500). That last package replaced the standard 17-inch 10-spoke wheels with 19-inch 5-double-spoke wheels and added the sport suspension and a three-spoke multifunction steering wheel with shift paddles. The Premium Plus package brings in xenon headlamps with the LED daytime running lights. You also get an Audi MMI navigation system with a 7-inch color display, Audis parking system with a rear view camera, online services, and advanced key, what allows you to keep your key in your purse or pocket while still having access to the interior. The MMI navigation system works by pressing the navigation function button to the left of the controller dial, then the settings control button. A list of navigation options are displayed including route criteria, map display, map type, and map content. You can choose standard mapping or Google Earths overlay to see actual satellite imagery. The center dial also allows you to choose letters to spell out what youre searching for just as you would with Google search. Choose a location from the results and zoom in for more detail. Once you’ve found what you want your route is mapped out. If you prefer, you can key in voice commands. What some might consider the A6s weakness is also its strength: a base engine that produces optimum power. It isnt especially fast, but it is no sluggard either it doesn’t strain under the weight of this near two-ton sedan. Moreover, Audi provides Dial Select, a feature whereby steering, throttle and transmission response are controlled to suit your driving style. If you’re in the market for an Audi A6 you may want to test both the four- and six-cylinder gas models; you may be just as surprised by the four as I was. Either way, you come away with a large midsize sedan that has outstanding handling. And that solid handling just may have you looking beyond traditional rear-wheel drive European competitors such as the BMW 5 Series, Jaguar XF, or the Mercedes-Benz E-Class, capable models all. 2014 Audi A6 photos copyright Auto Trends Magazine.